Tech Billionaire Vinod Khosla is always good for stirring it up at a Healthcare Technology event and at the Connected Health Symposium in Boston he’s commented on video consultations with Doctors making an assumption that I think is ignoring the big change that happens when you empower Patients with the ability to share information with you and reach you via the device that’s already in their pocket. I really welcome the contributions of smart technologists like Vinod Khosla to conversations about where healthcare is going but I think it’s important that we appreciate where they originate from and that we weight them together with the opinions of those of us who have experience providing care and practising medicine. There should be no doubt that the healthcare industry needs smart people like Vinod Khosla to shake things up. I for example fully expect to learn more at next weeks WebSummit (an event that is sponsored by fizzy drinks brands!) than at the mHealth industry meetings that I will attend around the world over the next month. The Partners Connected Health event in Boston was an event that really needed Khosla’s input as their understanding of tech was all over the place eg. remember when they were gushing on about kitchen counter automatons with blinky eyes as though they would save the world? We hear about this all the time from technologists but it’s really wide of the mark as it’s comparing apples and pears. I don’t really get why technologists think self driving cars are somehow as complex as Patients. mHealth is becoming compulsory and we’re slowly getting medical devices that have embedded connectivity but a Google self driving car is fundamentally different because it really has no choice about decisions as they’re all programmed to be made for it. If they programmed a personality into a Google car I’m sure the frequency of errors would never permit it onto the highway – who would want to ride in one after it indulged on 50 litres of Ethanol? Fail to take on this best practice and 99% of the time you’ll have a Video Consulting service that achieves little more than a Patient could get by Googling their symptoms and involves Doctors waving at Patients (because there is no context for the consultation) before telling them to go visit their normal Doctors office or to a drug store to pick up a prescription for an antibiotic that they don’t need. Doctors don’t need information to be able to better program their Patients behaviours they need it to know how to motivate them. The next generation clinically validated version of Symptom Checkers is already deployed at leading institutions like the Mayo Clinic, here at 3GDoctor (in the UK and Ireland only) and by GPs working in the NHS (see AskMyGP). It collects the relevant medical history information and presents it to the Clinician in a standardised format before the consultation begins and it enables the Patient to be provided with a concise electronic report of the information that was shared and the advice that was given in the consultation. This already happens and it’s not just shifting workload to another Healthcare Professional it’s empowering self care and helping Patients and their Carers to get the care they need more efficiently. In his 2009 Mayo Clinic Proceedings Paper Dr John Bachman MD, Professor of Primary Care at the Mayo Clinic, has already shown that Patients who share an Instant Medical History output with their Doctor can safely manage 40% of what would be a Family Doctor’s normal workload. 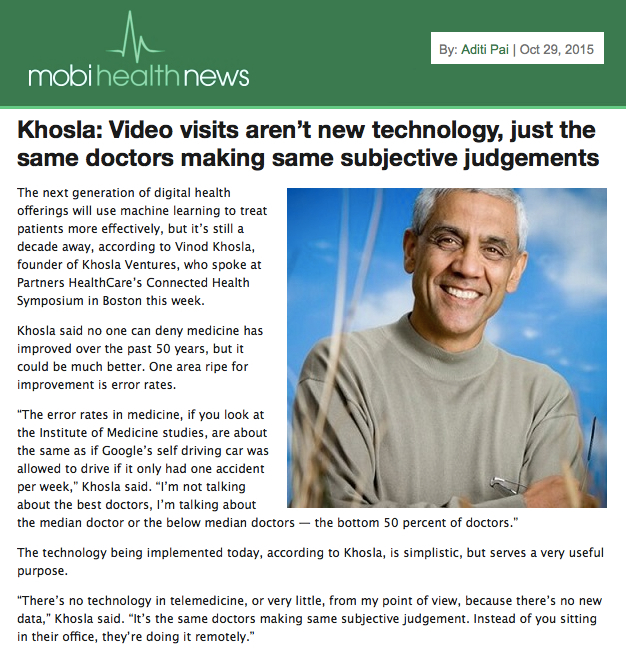 I think Vinod Khosla’s confusion arises because he’s failing to see the connection between mHealth tech and remote Doctors who can see the data being captured by the Patient. I don’t understand why this confusion exists for an Alivecor investor eg. there are plenty of Patients here in Ireland who have been prescribed Alivecors who get to send ECG data direct to their Cardiologists. These Clinicians have already started answering the more advanced questions Vinod Khosla is talking about computer systems answering. I think Vinod Khosla has missed the memo from Alivecor about the reassuring “No abnormalities have been detected in your ECG” message that today gives Patients with the Alivecor app the ability to look at a single lead ECG in a way that’s almost equivalent to a Doctor reading it. I think the 6 hour prediction thing is interesting and there have been mHealth tech companies like Cardionet that really talked this stuff up but the jury is still out. What will happen when a rival rocks up with an app offering you a 12 hour or a 12 month prediction on having a heart attack? Isn’t it obvious that customers will start feeling a little bit like a bee in a colony? I think the proponents of Big Data need to ask themselves the following question before trying to predict the future: If a big data calculation told you to walk to work today in high vis clothing and a cycle helmet would you do it without questionning it or are there some risks you’re prepared to take to live your life? A hard sell maybe but perhaps by the time it’s available Google will know how to convince us we need it? On Twitter this morning I asked the question ‘if big data told you to go out tonight in high vis clothing would you?’ as I find it humorous that the very entrepreneurs who turn right when they are told to turn left seem to think having big data make decisions for us is the answer to the healthcare industries problems. It started an interesting chat that eventually ended with me being shot down with the accusation that I’m such a bore that this discussion with me amounted to “death by Twitter”. I wonder how many people realise how boring life might be when every uncertainty in your life is determined by looking at a graphic that has been produced by calculations of big data sets that are so voluminous that it would take you weeks to just analyse the data that is presented to you to decide upon in a fraction of a second? David, that is a complete misrepresentation of my comments. I did not call you a “bore”. Like many of your ill-informed statements it twists reasonable debate from other people to fit your own narrow-minded views. I jokingly called our discussion “death by Twitter” because you don’t discuss – you try to browbeat and project your views onto others by thinly veiled sarcasm and dismissal, You are not boring, but you are close-minded and arrogant enough to make many reasonable people avoid talking with you. The ultimate irony is that the mHealth Insight Twitter account summary says “let’s find ways to improve healthcare”. Clearly it should add the corollary “as long as those ways align exactly with my views and no others”. Enjoy being a professional keyboard warrior! Comments don’t seem to be working? Yes you’re correct my Twitter account summary does says “let’s find ways to improve healthcare”. I see calling out hype as being a way of improving healthcare and presenting the evidence I have (eg. as above where I’ve quoted a Mayo Clinic Proceedings paper by Prof John Bachman MD and the slides from Dr Richard Sills’s talk at the recent International Congress of Aviation and Space Medicine) as being a key part of how I do this. PS. while I welcome the contributions of others to help improve healthcare (and call out hype) from your comments I see that while I’m not a bore I am in your opinion a ‘narrow/close minded keyboard warrior’ so if you don’t mind I’d like to take you up on your offer to ignore me in future, thanks.